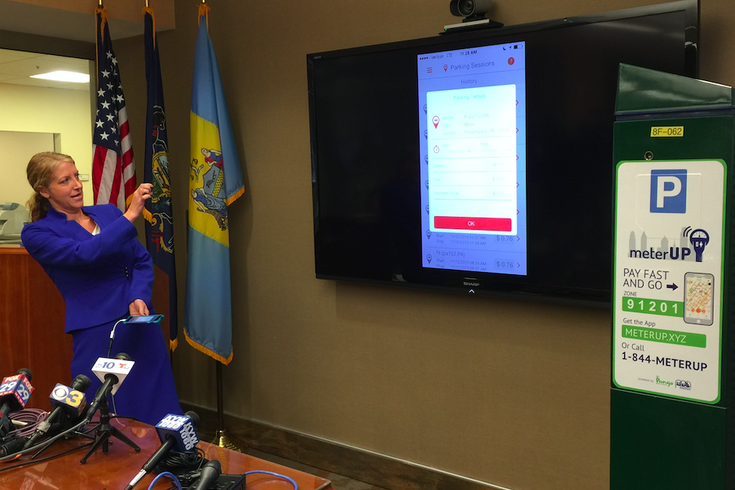 Philadelphia Parking Authority Project Manager Sue Cornell shows how to use the new "meterUP" app, which will formally launch in four pilot-program areas on Thursday, Nov. 19, 2015. The first week into a six-month pilot test of the Philadelphia Parking Authority's new pay-by-phone parking app is going slowly, the Philadelphia Business Journal reported. The app, called meterUP, allows users to pay for parking from their phone. It launched Nov. 19 with a promotional offer of one hour of free parking for the first 5,000 users, but there were still more than 2,000 free hours available as of Saturday. Between the launch date and the day before Thanksgiving, there had been just 123 transactions on the app. One issue is that the app is available on a relatively small number of streets. The app is being tested in a core area of Center City, a rectangular area bounded by Arch Street, Locust, 4th and 20th, as well as a few streets in Old City and Midtown Village. Out of 267 parking kiosks in the Center City zone, 42 had signs up for the app posted. In addition, a development error caused the app to be 160 MB to download on a smartphone. This has been fixed, and the app is now less than 50 MB. Nevertheless, such growing pains could be expected at the beginning of a pilot program. The PPA notes that the app involves several convenient features, such as alerting people if their parking session is about to expire, which may help it to rise in popularity. It's available on smartphones and traditional phones, through text messaging. In addition, the app allows participants to extend their time without walking out to put more money in the meter. However, if you have parked longer than the maximum time allowed, your rate will double, and if the time is extended again, the rate will triple. For example, someone who parks six hours in a two-hour spot would pay the normal rate for the first two hours, double rate for the second two hours and triple rate for the last two hours. However, if you pay at the kiosk initially, then later pay with your app, you'll be able to avoid the double rate. To download the app, search for meterUP on your smartphone, call 1-844-meterUP or sign up on http://meterup.xyz.